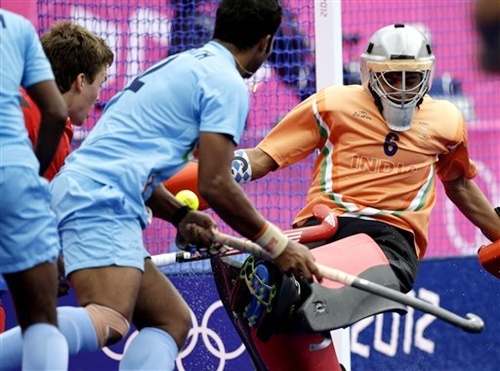 Rediff.com » Sports » What went wrong with the Indian hockey team at London? Bikash Mohapata analyses the disaster with former India players Joaquim Carvalho and M M Sommaya. In an Olympics where Indian athletes delivered their best performance ever, it was sheer irony that the sport which has, over the years, ensured the country the most medals failed to deliver. India's final tally of six medals at the London Games is its most in a single Olympics, a credible achievement in a country staved of sporting success. It marked its zenith in the quadrennial event, a reason to celebrate for sure. At the same time it is also important to accept the stark reality and lament in that acceptance. For India's performance reached the nadir when it came down to hockey -- which has delivered 11 of its 26 Olympic medals. The eight-time gold medallists, having failed to qualify for the Beijing Games four years back (another first), finished with the wooden spoon in London, its worst performance ever. If one keeps emotions aside it is not difficult to realise that Indian hockey has had a steady decline in the last few decades. Seven of India's eight gold medals came during a hugely productive spell between 1928 (Amsterdam) and 1964 (Tokyo). In the ensuing 48 years, the national team could add just one more gold to the tally, at the Moscow Olympics in 1980. However, take into account the fact that most of the big teams boycotted those Games as also the fact that India struggled for a result against the lone team of any repute in that competition -- against Spain in the final -- and it takes some shine out of that achievement. It's been a steady decline since with India finishing a lowly eight in the Atlanta Games in 1996 --its worst effort prior to London -- and failed to qualify for Beijing. Despite these bare facts there was one thing kept the fans glued to the sport -- hope. Ahead of the London Games these hopes were corroborated by a good showing in the qualifiers and a third place finish in the Azlan Shah tournament. When the team went down fighting in the opener against eventual silver medalists the Netherlands the expectations of a top six finish -- the team was never expected to win a medal --increased. However, more is the hope, more is the despair. What followed thereafter can best be described in one word -- forgettable. For India lost all its five matches in the group to finish last and to make matters worse, succumbed to lowly South Africa in the play-off for the last two places. The disastrous performance made one think if it is better not to qualify than do so and get humiliated in a manner like this. It also opened a can of worms, though for once the players weren't the only ones to be blamed. "Never in our history have we performed this badly," lamented Joaquim Carvalho. "The Olympics qualifiers were stage-managed. We went gaga over beating the likes of France and Italy, teams with absolutely no credentials. "We were satisfied with mere qualification, simply because we had missed the bus in Beijing," he added. The former India Olympian and coach went ahead and analysed the debacle. "You can't blame just the players," he said, adding, "They were mere pawns in this struggle for power between the two camps, IHF and Hockey India. "The blame lies in the selection process, which according to me was biased. (Narinder) Batra and company misled the nation for their own selfish interest. "The players who participated in the World Series Hockey (WSH) were deliberately kept out. If a country like Pakistan can keep its national interest ahead of personal egos, and finish ahead of us (seventh), why can't we do the same?" "They played well in the first match against the Netherlands. However, I feel after that they were completely drained out, explained the man who also led the Indian side in the Seoul Games in 1988. "There was a lot of pressure during the build up and that affected the mental make-up of the players," continued Somayya, before admitting, "They were not able to cope with a tournament as huge as the Olympics." Michael Nobbs, the Australian in charge of the team, has come in for a lot of flak following the debacle, but Somayya felt he should be persisted with. "Any coach should be given four to five-year tenure and shouldn't be judged on the basis of a tournament," he said. "If you look at the statistics none of those who have coached India in the last 25 years have done well," added Somayya, trying to justify his point. Carvalho, however, was not quite in a mood to pardon. "Nobbs is no great coach. What credential does he have to be considered for the job?" he asked, before proceeding to offer an explanation on his own. "He kept mentioning about speed and attacking hockey that teams like Australia play. But these teams do that according to a game plan whereas I found no strategy at all when it came to the Indian team," said Carvalho. "When you have the likes of Ronald Oeltmans applying for the job, he has an impressive resume. 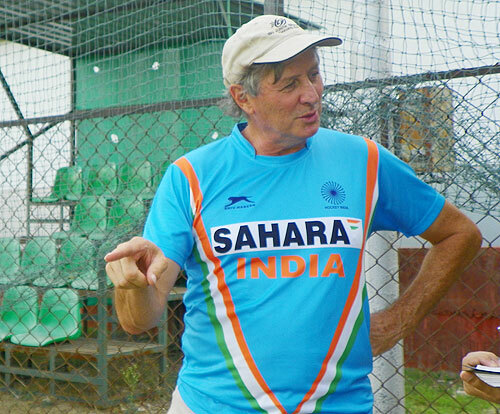 If you want to have Indian hockey back at the top you need to pick up the best coach," he added. On a positive note both agreed it couldn't get worse than this. And that the team has to start on a clean slate now. "There's no point in having a knee-jerk reaction. In a month from now this team might beat some of the teams it lost to in London," opined Somayya, the more generous of the two voices quoted. "We need to take a more balanced approach instead and focusing on starting afresh. We can only look up from where we are placed now," he added. Carvalho emphasized on long-term planning as a solution. "We need to start thinking about the 2016 Games in Rio de Janeiro, and even the 2020 Olympics for that matter, if we want to get back to the big league," he explained. "And we have to start thinking big, and not make compromises as has been the case for quite some time now," he added. Despite the disappointing show in London our team is way ahead when it comes to the overall record. It will take another country a long time to match India's tally of eight gold medals – Germany being the second in the list with four gold medals. More importantly, though, it will take a colossal effort for this Indian team to recover from this disaster and attempt to add to that tally. Till then, hope floats. As it always has for us the ever-optimistic Indian fan.